For every gorgeous summer walk, there should be a beautiful picnic basket. Whether you’re driving to your favourite beach or walking to the perfect hilltop spot, we’ve put together a selection of the best picnic baskets so you can purchase your next sunny weather essential. When you've chosen the best picnic basket, head to our sourcebook of top garden suppliers for more garden-related shopping. What is the best picnic basket? The best picnic basket is the Ascot Picnic Basket, which comes from champions of all hampers and picnic delights – Fortnum & Mason. It’s luxurious, filled with bone china plates and mugs, cutlery sets and a corkscrew for enjoying champagne and strawberries in the great outdoors. Alternatively, retailers such as Wayfair and John Lewis are great places to get hold of slightly less extravagant picnic baskets, like the Croft Collection Filled Picnic Hamper. Those who love walking to their favourite picnic place should view the Fortnum & Mason picnic backpack, which is designed to provide the additional comfort required when you’re covering the miles. When you’re browsing, look out for filled picnic baskets that include dining sets and make sure you watch out for how many diners it caters for; some cater for two, some cater for four. No picnic blanket in your favourite picnic basket set? We have a buyer's guide to the best picnic blankets. Featuring Fortnum & Mason’s signature crockery plates, cutlery and champagne glasses, this hamper features everything you need to enjoy a warm summer’s day outside. With salt and pepper mills for a touch of last minute seasoning, a corkscrew – because no picnic is complete without a glass of wine – and two champagne glasses for sipping away in style, it may come with the Fortnum & Mason price tag, but is perfect for treating someone to the quintessential British picnic we see in old films. While it may lack the Fortnum and Mason name, this Somerley is a great contender when it comes to the best picnic baskets. It’s super stylish with its traditional French patterning and combines its wicker body with leather straps to keep everything neat and tidy. With four sturdy wine glasses, china plates, cutlery and even little plastic salt and pepper shakers included, this basket contains everything you need for an afternoon in the sun. For something slightly different, this hamper style picnic basket with its compartments dedicated to wine bottles is the perfect gift idea. Plates, cutlery and wine glasses are neatly stored away in the middle section, which is easily fastened using the leather strap and there’s napkins and a bottle opener to complete the set. With its open design, it’s best for shorter strolls or transferring it straight from the car. Nothing ruins your favourite walk more than being lumbered with lugging a heavy picnic basket, which is precisely why Fortnum and Mason have created this backpack. While the inclusive dining set may lack the finesse of our first pick, with four plates, cutlery, plastic tumblers so you don’t need to worry about breaking anything, and a cheeseboard, you everything you need for a rewarding light lunch once you’ve reached your favourite spot. Grab a bottle of wine, fruit, cheese and some of yummy savoury pastries and head to your favourite spot for some chilled out downtime together. The cool bag is perfect for chilling the wine while the fleece blanket provides somewhere comfy to park your bottoms while you enjoy your meal in the sun. With plates, sturdy wine glasses and a bottle opener included, it features everything you need for a great date. If you’re looking for a good looking wicker picnic hamper with a decent price tag, this one could fit the bill. Designed for four people to dine and with plenty of space to store your special treats, this is perfect for an afternoon in the park. With tumblers instead of wine glasses and sturdy cutlery and crockery, this hamper has certainly been designed with families in mind. 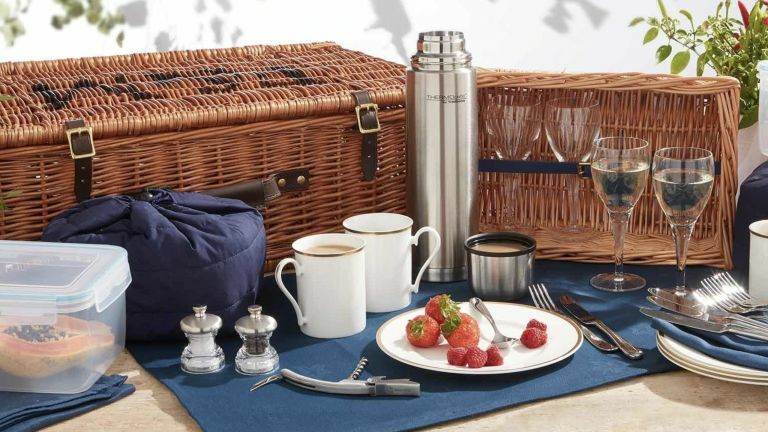 With its traditional cotton lining and matching waterproof backed blanket, this picnic hamper set is stylish, functional and not particularly pricy. While it lacks the Fortnum and Mason name and quality (plastic glasses and non leather straps), for an impromptu march to the park to watch the kids while they play rounders, this hamper set is the perfect buy. What's a picnic without some tunes? Take a look at our top-pick DAB radios for a mini music-maker you can take on the road.